Cyprian Kizito Lwanga has castigated MPs for passing the age limit bill. File photo. 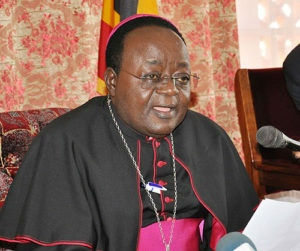 The Archbishop of Kampala, Dr. Cyprian Kizito Lwanga, has expressed discontent over the recent passing of the age-limit bill by Parliament. In his Christmas and end of year message, Lwanga said the amendments were not done in good faith. MPs last week voted to scrap age caps from the Constitution, a process that has divided members of the public. Archbishop Lwanga said the nationwide consultations were done but there are still feelings of betrayal from the voters by their Members of Parliament. He said it is unfortunate that MPs didn’t listen to advice from religious leaders and elders who requested them not to amend the Constitution. Lwanga also condemned the alleged misuse of the parliamentary chapel by security officers during the time when the age-limit bill was being debated. He said the Catholic church will perform rituals to cleanse the chapel and asked the culprits to apologise and repent. He also urged religious leaders to join the call for a transparent democratic system because it is the foundation upon which citizens’ rights are fully exercised.